The most common form of heart disease is coronary artery disease (CAD), a narrowing of the arteries that supply blood and oxygen to the heart. CAD, also called coronary heart disease, is caused by a build-up of plaque in the arteries (called atherosclerosis). Large AAA in 78-y-old man with history of lung cancer. Unenhanced CT shows uniformly dense aortic aneurysm. 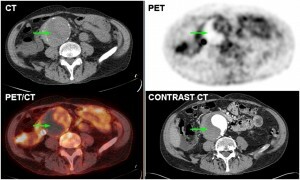 PET shows region of tracer void in lateral aspect of aneurysm, suggestive of thrombus, and physiologic blood-pool activity medially giving ying-yang pattern. Suspected thrombus was confirmed with contrast-enhanced CT.
CAD is the leading cause of death in the United States for both men and women. In CAD, fatty material, consisting of fat, cholesterol and other substances, collects on artery walls. As this fatty material hardens, it forms calcium deposits called plaques. The build-up of plaque makes a blood vessel narrow and less flexible and eventually, may block blood flow. Reduced blood flow in the coronary arteries may cause chest pain (angina), shortness of breath, a heart attack and other symptoms. Small pieces of plaque (called unstable atherosclerotic plaque) may break away and lodge in smaller blood vessels, blocking blood flow. This blockage, called an embolization, is a common cause of heart attack and stroke. Blood clots can also form around a tear in the plaque leading to a blockage. A blood clot that moves into an artery in the heart, lungs, or brain can cause a stroke, heart attack, or pulmonary embolism. Plaque may also weaken the wall of an artery leading to an aneurysm. Today, many patients are evaluated for coronary artery disease by invasive tests such as angiography, which involves inserting a catheter into the body and threading it into the aorta. Molecular and nuclear imaging offer the opportunity to assess blood flow non-invasively–without making a surgical incision or inserting a medical instrument into the body. How does molecular imaging help people with CAD? select patients who may benefit from revascularization, or coronary bypass surgery. Clinical trials are currently underway to evaluate the use of molecular and nuclear imaging as the primary method of assessing patients with suspected coronary artery disease. Scientists are also exploring molecular approaches to detecting unstable atherosclerotic plaque before it causes damage.